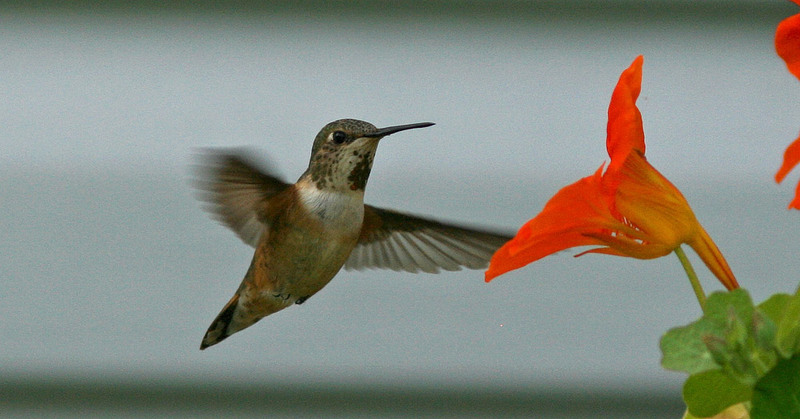 This adult female Rufous Hummingbird was visiting a yard in Middle Cove on the northeast Avalon Peninsula in mid-August 2011 – the fourth record for the province. Origins: Breeds in the Pacific northwest from southern Alaska to northern Califonia, inland to the foothills of the western Rocky Mountains. The winter range includes southern California, Mexico and the Gulf coast. It is a rare but regular wanderer further east, mainly in late summer and fall. Specific identification of immature/female individuals is often tricky due to similarities with the very closely related Allen’s Hummingbird. Record Details: Four records for Newfoundland – two of which were female/immature types of the Rufous/Allen’s complex and presumed to be this species based on history of vagrancy. (1) An immature/female hummingbird observed in St. John’s in early September 1983 showed several features of this species complex. (2) An adult male present at the MUN Botanical Gardens, St. John’s from August 4 -15, 1985 provided the first definitive record for this species. (3) Another adult male was present at the northern extreme of Newfoundland in St. Anthony from August 13-15, 1988. (4) An adult female was visiting a yard in Middle Pond (south of St. John’s) from Aug 18-20, 2011.